Writing experts say you should record the ending of your story first. That way, the writer has a direction and is not wandering around aimlessly. 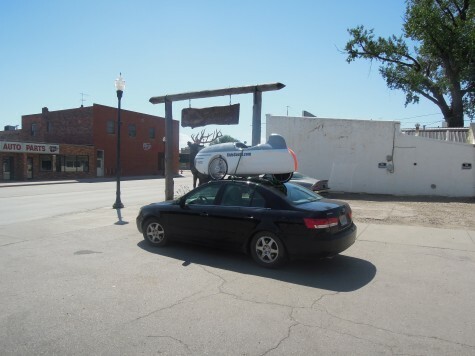 Occasionally, I listen to experts, so here is the ending of my Roll Over America (ROAM) story a couple of years ago. Kendall and Garrett in Montana with Mango on car. My nephew and niece brought me and the Mango home early, wounded in every way. The Mango was held together with duct tape and I was held together with Second Skin. 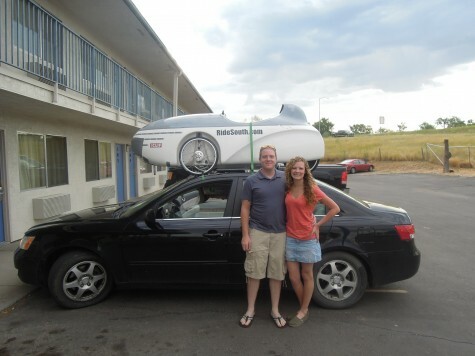 Garrett had flown to Jackson, Wyoming to help Kendall drive back home to Hope Hull, Alabama. I bribed them to make a five-hour detour to Miles City, Montana where the ROAM group was camping. Martin and I had elected to stay in a nearby hotel because he was also considering heading back, to England. The kids stayed in an adjoining room and we headed out the next morning. The major interstate heading south was closed due to flooding and we had to take many back roads. Disappointment weighed me down considerably and I became intolerant of Kendall’s smoke breaks as we searched for a hotel room somewhere in South Dakota after midnight. Sorry, Kendall. After all it was her car and her trip. The car was a Hyundai sedan with a hole in the top where the destroyed sunroof used to be. More duct tape and a cardboard windshield sun shield we had purchased at a truck stop did a fair job of keeping the rain out on several occasions. The low-pitched noise of the improvised sunroof, however, made its way into the passenger compartment quite well. The Mango did well throughout the storms we encountered. After seeing thousands of motorcycles along the highways, we had to stop in Sturgis at Wall Drug for lunch. The lunch was normal but we had never seen so many people trying to be different and rebellious. We realized they were having fun in their own way, and had an inner understanding of their bewildered looks as we made our way through town . . . with a velomobile perched atop Kendall’s little car. The kids dropped me off in Jackson and continued to Montgomery. They had lost some hours, but gained financially and I had made it home to heal. There are physical scars on my arm, hands and head reminding me of the experience. There are deeper wounds of giving up, tempered by the good memories of the trip that was undertaken to learn about velomobiles and the people who pilot them. I will never know if I could have made it to DC had I not crashed. Most made it but some did not. I did learn a great deal about velomobiles, their capabilities and limitations. The Mango has been repaired and reinforced with Kevlar. The all white paint looks better than before. I have made many improvements to the handling of the machine, but still temper my speed a bit. I have probably learned less about my own limitations and would consider a return trip.